Definition at line 142 of file LazyValueInfo.h. Definition at line 147 of file LazyValueInfo.h. Definition at line 150 of file LazyValueInfo.h. References assert(), F(), Info, llvm::LazyValueInfo::releaseMemory(), and runOnFunction(). 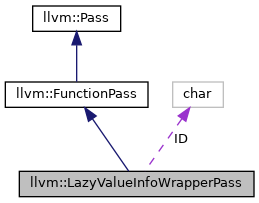 Definition at line 1523 of file LazyValueInfo.cpp. Definition at line 1529 of file LazyValueInfo.cpp. Definition at line 1553 of file LazyValueInfo.cpp. 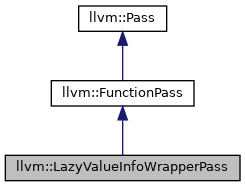 Definition at line 1507 of file LazyValueInfo.cpp. References llvm::Module::getDataLayout(), llvm::DominatorTreeWrapperPass::getDomTree(), getImpl(), llvm::GlobalValue::getParent(), and Info. Definition at line 146 of file LazyValueInfo.h.